His first “real” rod was red and all of three feet long, with Mickey Mouse on the reel and a little, yellow rubber fish attached to the line. It wasn’t long until the reel without a hook was no longer satisfactory, and Tuck graduated to a new real rod, hook and all. He learned how to put on worms and release the fish he’d caught. Every vacation, he made sure his fishing pole was the first thing in the car. But as he grew older, his interest in fishing waned, replaced by more active endeavors like skateboarding, biking and basketball. Yet just this past Memorial Day, there he was casting a line way out into the water. “I haven’t seen him fish in ages,” I said to my husband who was sitting nearby, changing the lure on his rod. I turned on the camera and saw the picture they’d taken just before releasing the large-mouth bass Lee had caught. “No wonder he’s inspired,” I said. 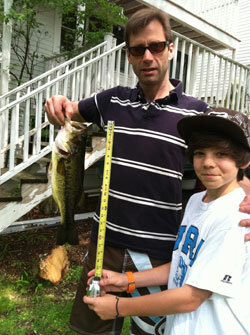 By late afternoon, Tucker had caught five small perch. “He won’t let these fish go,” Andie complained, staring into the bucket where the six-inch fish were swimming around. “I want to cook them for dinner,” Tuck said, flipping his hair out of his eyes, which were big with excitement. I noticed the sun had lured a few new freckles out on his nose. “Dinner?” I asked, thinking of the nearly packed car and the early bedtime I’d wanted for the kids. Looking into the wide eyes of my soon to be thirteen year old son, I knew this was a significant event. “Andie you love fish,” Tucker reminded her. “Those are fish from the store,” she said, prompting a discussion on food sources. Later she “accidently” let one go, but Lee helped her catch a replacement, which she reluctantly put in the bucket with the others. As Lee and Tuck covered the picnic table with newspaper and sharp knives, Andie hovered nearby. She squealed when Tucker cut the heads off the still wriggling fish, but his squared shoulders seemed to be say Look at me providing sustenance for my family. Five little perch isn’t a lot of sustenance, but with baked beans and left over pasta, it amounted to quite a meal. We each had a few 1×3 inch fillets that Tuck had dredged in milk and breadcrumbs and fried in butter. Andie, who wasn’t going to eat her little friends, pleaded with everyone to share a little more off their plate with her.